A pristine proof of the full jacket, with Muller's publication date stamp on the front flap. 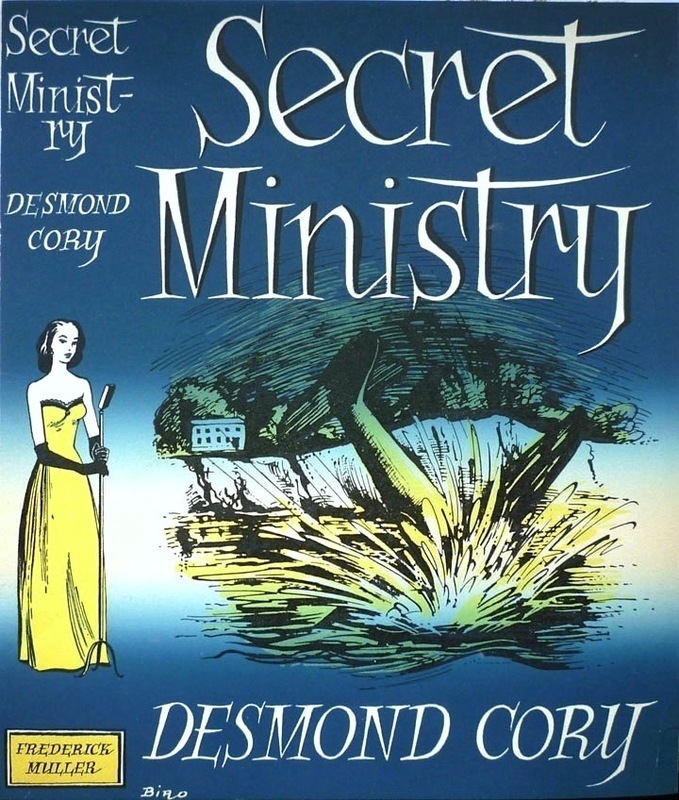 Val's original artwork is seemingly long lost (unless anyone knows otherwise...), but publishers would often send Val a proof of the jackets he designed, and such was the case with Secret Ministry. 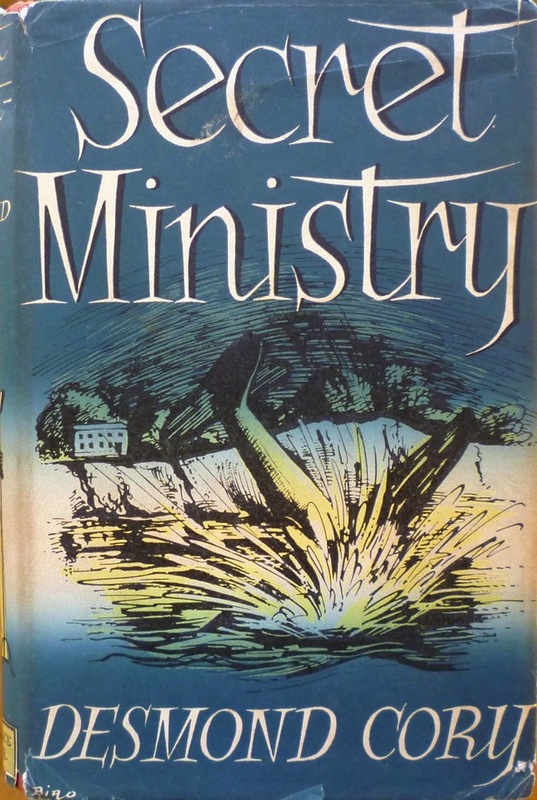 Finding a first edition of Secret Ministry, let alone one in a dust wrapper, is nigh on impossible – I had to order mine from an African website, remember – so to come into possession of not only a pristine wrapper but an additional proof of the front and spine is quite something. 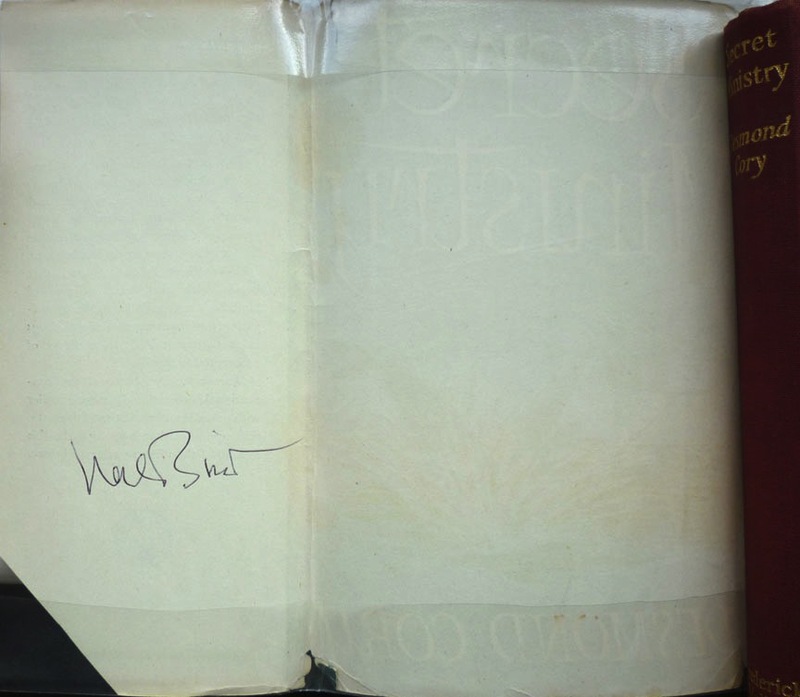 So I now own not only the single (physical) copy of Secret Ministry I've ever encountered, but its jacket bears Val Biro's signature. Meanwhile I've replaced the image of the slightly battered (but now signed) jacket wrapping my copy of Secret Ministry in the Beautiful British Book Jacket Design of the 1950s and 1960s gallery with an image of the proof – and very lovely it looks, too. Nick - thanks for opening my world to the art of Val Biro and Desmond Cory novels. I visited the link to Val Biro's site and was quite impressed. I've downloaded some of Cory's ebook version on Amazon, impressed by the many reviews written about him, but it just doesn't replace having the physical copy and artwork. A bit like preferring the vinyl version of records with their sleeves rather than just an almost intangible MP3 version. My pleasure. Lots more to come on both Biro and Cory, including some more original artwork from the former and some more Johnny Fedora from the latter. Louis XIV - your article has triggered some interesting emails to the Desmond Cory website. In addition to not knowing about this wrapper version of the first edition of Secret Ministry, a gentlemen from Australia to show us a totally previously unknown paperback version of it. 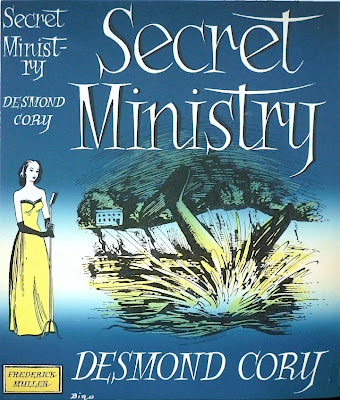 The paperback of secret ministry has no date inside and was printed for "the shakespeare head" by "congress printing". The cover is a man driving off the cliff in his car. Estimated date around 1956. So thanks for being the catalyst for some great new discoveries about Desmond Cory. My pleasure! That would be Pascal who contacted you about the unknown paperback I assume -- he dropped me an email with a scan of the cover, so I sent him your way, as I didn't think it was in your cover galleries. I think I mentioned Shakespeare Head in another Cory post and someone left a comment about who they were; will have to look back and see if I can find it. Spot on - thanks for passing Pascal on to the site... and giving us a totally new book cover never seen before. 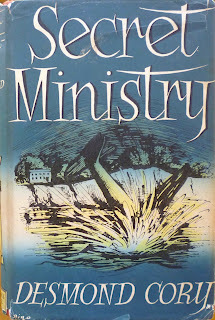 Pascal wrote back - he did some sterling detective work on this and discovered this SECRET MINISTRY paperback is dated May 1952, making it the first paperback version of this novel found so far. What other new discoveries will we make about Desmond Cory? What indeed? Certainly plenty more to come on Cory from me – I have some more Fedora first editions I'll be writing about soon enough.